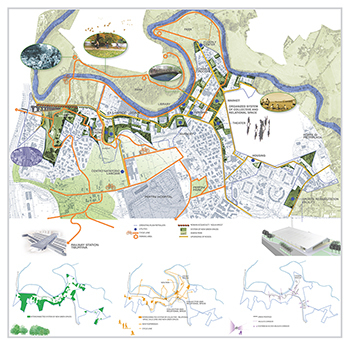 The area of the Pietralata Integrated Program is located in Rome’s Northeastern quadrant, where the city’s outskirts grew after World War II, along the river Aniene to the north and the Via di Pietralata, covering approximately 63 hectares. 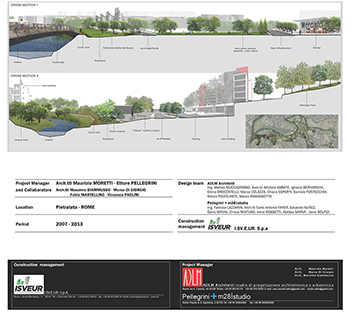 Pietralata is a typical example of the Roman urban areas which grew spontaneously and which make up the image of contemporary Rome’s suburbs: superimposed and distorted, compromised by an improper use of its functions, but still with a strong identity to be rediscovered. 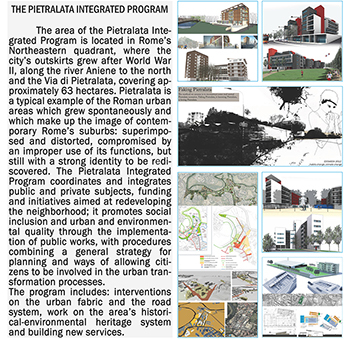 The Pietralata Integrated Program coordinates and integrates public and private subjects, funding and initiatives aimed at redeveloping the neighborhood; it promotes social inclusion and urban and environmental quality through the implementation of public works, with procedures combining a general strategy for planning and ways of allowing citizens to be involved in the urban transformation processes.